Nano One Materials, based out of Vancouver, is a Canadian technology company with an industrial process for producing low cost high performance battery materials and a wide range of other advanced nanostructured composites. The company has recently received grants for automotive technology for their process to improve the durability of lithium ion batteries. Nano One Materials is the recipient of $349,000 in automotive grants from the National Research Council of Canada Industrial Research Assistance Program (NRC-IRAP). The Industrial Research Assistance Program (IRAP) supports the development and commercialization of innovative technologies, while accelerating businesses’ growth and competitiveness. The program offers business research and development funding to Canadian companies that develop or innovate leading-edge technologies. Nano One Materials has a three-stage industrial process that is being engineered for high volume production and rapid commercialization. They are utilizing this process to develop patented technology for the low-cost production of high performance battery materials used in energy storage, consumer electronics, and electric vehicles. The Industrial Research Assistance Program has awarded Nano One Materials with $349,000 in grants for automotive technology. IRAP funding will allow the company to carry out their project to develop coatings for high durability lithium ion battery cathodes. This is to meet the demands of the automotive industry, which is seeking to extend the range of electric vehicles by incorporating batteries with higher energy densities. The goal of this project is to determine the optimal combination of dopants and coatings that could reduce instability and durability in high energy cathode materials. The low-cost method of applying coatings and dopants to cathode materials will industrialize the process to further differentiate Nano One’s commercial offering. Nano One has previously received NRC – IRAP automotive research grants to support their High Voltage Spinel Project. With the success of this project, the High Voltage Spinel (HVS) will serve as the primary material for the battery project as it is both cobalt-free and a strong candidate as cathode material for next generation solid state batteries. The Industrial Research Assistance Program (IRAP) is a Canadian government funding program designed to accelerate Canadian innovators’ research and development projects. The primary targets to receive IRAP funding are businesses who are developing and implementing process improvements, however, large-scale technology adoption projects that lead to new capabilities are also considered. Through IRAP’s streams, businesses may receive up to 50-80% of eligible costs to a maximum of $10 million. Administered and managed by the National Research Council of Canada (NRC), NRC-IRAP grants are funded through the Government of Canada, meaning that applicants from across the country can apply to receive funding support. The next round of funding through IRAP will be released in April 2019. Canadian innovators looking to perform advanced research projects, such as the ones mentioned in the article, should consider using government funding to offset costs. To help simply and navigate the process, Mentor Works has created an IRAP vs. SR&ED guide to give business leaders a breakdown of Canada’s two most popular research project funding programs. As mentioned, this includes the Industrial Research Assistance Program (IRAP) grant, as well as the Scientific Research and Experimental Development (SR&ED) tax credit. Access it today to compare elements of the IRAP and SR&ED programs to determine a suitable fit for your upcoming strategic growth projets. 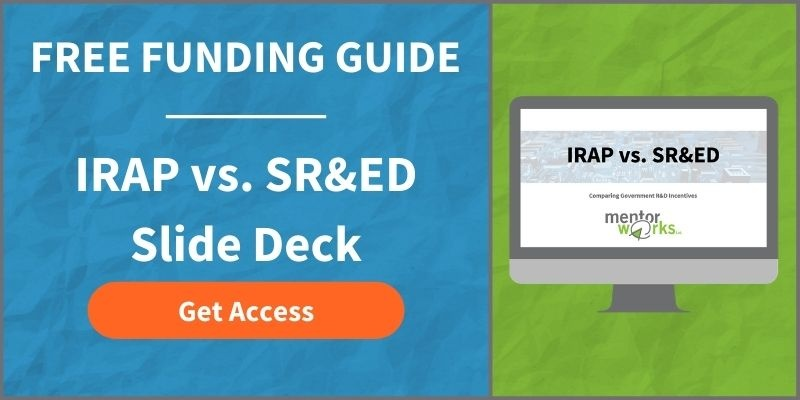 Download the IRAP vs. SR&ED slide deck.